Facebook’s recent public offering captured the dreams of many, who — upon seeing imagination and innovation translate into riches — enthusiastically invested. By the end of its first week of trading, however, it was clear it takes a strong stomach to play in today’s volatile markets. Yet, if you are to avoid the eroding effects of inflation and future taxes on your wealth, you need to invest in equities. That means managing risk — and embarking on your investment journey with a strategic plan firmly in hand. There is no doubt that, given the global financial crisis and the unprecedented volatility of global markets in recent years, we are in uncharted waters. Navigating the many hazards requires discipline and skill — and a plan. That’s why the theme of this year’s Distinguished Advisor Conference (DAC) is Navigation: Charting a New Financial Course. It is all about managing risk by planning. For example, Patricia Croft, an independent economist whose area of expertise is global macro economic analysis, will make the case that re-entry into the markets is necessary to make progress in building wealth. It is understandable, says Croft, a Day 1 speaker, that shell-shocked investors, weary of the financial crisis, should be extremely shy of equities. Croft, the president of Croft Consulting, will examine the global economic environment and its implications for Canadians’ asset-allocation strategies. Voted one of the top economists in Canada, Croft is especially bullish on the Canadian dollar and will explain why. It’s Your Money. Your Life. Investment risk takes many forms: political, economic, legal, tax, security, to name just a few. Successful captains set course with a plan that takes into account the anticipated risks before steering their ships into rough seas. For investors and their advisors, that makes risk management a key element in joint decision-making. Evelyn Jacks is president of Knowledge Bureau and founder of the Distinguished Advisor Conference, now in its ninth year. This annual event attracts hundreds of top advisors from across Canada to discuss the most recent trends in economics, tax, investment, retirement and estate planning. If you are an unincorporated small-business owner rushing to make your June 15 tax-filing deadline, or the shareholder of a corporation, you may be interested in several “red tape” reduction initiatives the Canada Revenue Agency (CRA) has introduced. The goal is to make it easier for you to file to and communicate with the CRA using the “My Business Account” portal. But remember: in the working partnership between you and the CRA, you still have important responsibilities, despite new online features. The secure “My Business Account” portal features a new landing page which allows you to make online enquiries (the CRA will provide a written response within 10 days and it stands behind that promise), file GST/HST returns and make or transfer payments. As well, the CRA will provide detailed reports on corporate balances and allow you to calculate instalments and payroll deductions. Quebec-based consultant Christian Belanger — who is giving a presentation at the Knowledge Bureau’s Audit Defence Workshop at the National Club in Toronto on Monday, May 28, — says Canadian companies and their advisors should periodically review the possibility that money is lying idle in corporate tax instalment accounts. Belanger has written a guide to assist in the recovery of funds. The CRA’s online enhancements will help businesses monitor possible overpayments. In the end, however, a successful relationship with CRA is all about the orderly retrieval of the documents supporting the numbers on your tax returns. From an audit perspective, the onus of proof is on you to ensure the hard facts match what’s happening online. It is also up to you to ensure that you are paying the correct amount of taxes. In an electronic world, when the CRA requests an audit, the need to produce relevant backup documentation is immediate. The fact that we are doing so much more online muddies the retrieval procedures for some — and makes reviewing your documentation storage and retrieval process crucial. Remember, there is a higher probability that business owners, commissioned salespeople claiming auto or other expenses, and taxpayers claiming discretionary expenditures such as childcare, moving expenses, donations or medical expenses will be audited. It’s Your Money. Your Life. Convenient new online services for businesses will help the CRA streamline its business operations, improve review and response times, and save money. Be sure you understand the effect of these changes on your responsibilities as a taxpayer, to make sure it works in your favour, too. Evelyn Jacks is president of the Knowledge Bureau. Join us at the Audit Defence Workshop May 28 in Toronto, 29th in Winnipeg and 30th in Vancouver. To enrol call 1-866-953-4769. When it comes to eroding your capital, there is no match for the expensive penalties you pay for failing to file your annual income tax return. But, on the bright side, if you file overdue returns before the Canada Revenue Agency (CRA) comes after you, you can avoid the big penalties. So, if you are delinquent, file your returns now — and save money. The CRA has been proactively slapping penalties on delinquents of $1,000 for each missed return, be it personal, corporate or GST. A real estate agent in Ontario paid $2,000 for failing to file her 2007 and 2008 personal tax returns and ignoring CRA demand notices. A British Columbia couple was fined $12,000 for failing to file 2006 and 2007 personal returns; four tax returns for their numbered company, five corporate tax returns and a GST return for one year. A New Brunswick man was fined $8,000 for failing to file his 2008 and 2009 personal tax returns and several GST returns and failing to comply with a court order. Subsequent failure to file on time within a three-year period: 10% of unpaid taxes plus 2% a month to a maximum of 20 months from filing due date. Tax evasion penalties of up to 200% of taxes payable if the CRA can prove you intentionally cheated by understanding income or overstating deductions or credits. Jail time is a possibly, too. Interest, too, will compound daily at the prescribed rate, plus 4% on all the combined amounts due. And take note: even if you have a June 15 filing deadline for your unincorporated business, interest is due on balances as the interest clock starts ticking as of the April 30 deadline. It’s Your Money. Your Life. Up-to-date tax preparation is the mandatory first step in your wealth-management plan. Avoid big penalties and minimize interest charges by filing your late returns now. Doing so before the CRA comes after you will preserve your wealth. Put it into a Tax-Free Savings Account (TFSA). Withdrawals from a TSFA are tax-free — meaning investment returns can accumulate inside your TFSA without generating taxes — making a TFSA tomorrow’s tax-free pension. So, do maximize this opportunity. Put it into an RRSP. It’s the next best thing to a TFSA, if you have contribution room. It will not only increase your tax refund next year, but it will also add to your tax sheltered savings and, in some cases, increase social benefits such as the Child Tax Credit. Given that the median annual RRSP contribution is about $2,800, Canadians can increase total sheltered retirement savings by 56% just by contributing the average refund. Pay down non-deductible debt. Debt that is not business- or investment-related — and, therefore, tax deductible — such as credit card debt, home mortgages and lines of credit erode your potential for savings. You can’t effectively optimize saving room if you are paying down debt, particularly debt bearing high interest rates. Shore up risk management. Every family should be able to go six months without earning income, in case of job loss, illness or caregiving responsibilities. How have you managed your risk? Do you have an emergency fund or insurance? Your tax refund can help. Reduce your withholding taxes at source. Next year, reduce that tax refund. Instead of loaning money to the government interest-free, it could be funding your future. You are obligated to pay only the correct amount of taxes — no more. So, review the amount of taxes withheld from your pay cheque. Reducing the deduction at source allows you, rather than the government, to maximize the time value of money. See a professional advisor. If you expect a major life event — such as a marriage or a divorce, a birth or a death — professional help can be a good use for at least some of that refund. It’s Your Money. Your Life. Remember, Canadians under the age of 54 will now wait two additional years, until age 67, to receive their $6,500 annually in Old Age Security. By taking control of your tax refund and investing it tax-efficiently, you are taking a giant step toward financial freedom: $1,570 invested each year for 11 years (age 54 to 65) amounts to slightly more than $17,000 — which means you can retire at 65 after all! 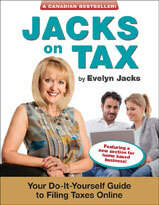 Evelyn Jacks is president of Knowledge Bureau and author of Essential Tax Facts 2012 and co-author of Financial Recovery in a Fragile World with Al Emid and Robert Ironside. Follow her on twitter @evelynjacks.